Security Essentials from the house of Microsoft is its answer to paid antivirus programs. These have been released by Microsoft to compete against different antivirus programs. This release from Microsoft promises to fight against malwares, spywares, malicious codes and viruses. This anti-spyware program was earlier called the Morro antivirus and was available for free for genuine users of the Windows OS. Microsoft Security Essentials (MSE) is by default designed in such a way that its virus database gets updated automatically on a daily basis. There might be a few cases where the MSE fails to update automatically because of its failure to work with the update schedule. The MSE by default checks for any new updates every twenty four hours and at an interval of every fifteen minutes it is checked whether the present updates are not older than twenty four hours. After collecting the required information the MSE gets automatically connected to Microsoft’s server and downloads the latest available update. If the system is shut down, or is in the standby, hibernate or sleep mode, the automatic updates schedule will be missed and the system needs to wait for the next schedule. One drawback of this program is that virus database is displayed as updated even if it’s not done on a regular basis. There might be cases where the Microsoft Security Essentials fails to get automatically updated and hence makes your system vulnerable to threats. Check if the wuauserv, the Automatic Update service is enabled or not. 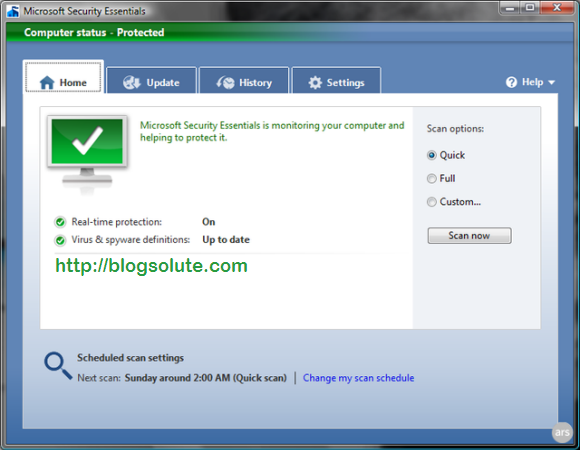 The user can also perform the manual update of the Microsoft Security Essential. You just have to click on the Update button in the Update tab. Force the MSE to get fully updated before every Scheduled Scan.